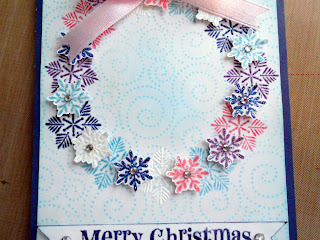 I had sometime before heading out to Christmas shop to make some cards :) This card is for ABC Challenge I is for Ice/Snow and Hero Arts monthly contest, add some shine. Believe me this card has lots of shine lol. I loved how my Pumpkin Wreath turned out last month so I decided to try it again, if it's not broke don't fix it right? I started with white card stock and stamped the big snowflake from Hero Arts Magic of Christmas set. for the white snowflakes I stamped in versa mark and embossed with white. For the other big snowflakes I stamped with distress ink﻿ in worn lipstick, broken china, chipped sapphire, and dusty concord then embossed with clear. I rubbed on some tumbled glass for the background then inked up Hero Arts Magical Background with more tumbled glass and stamped. 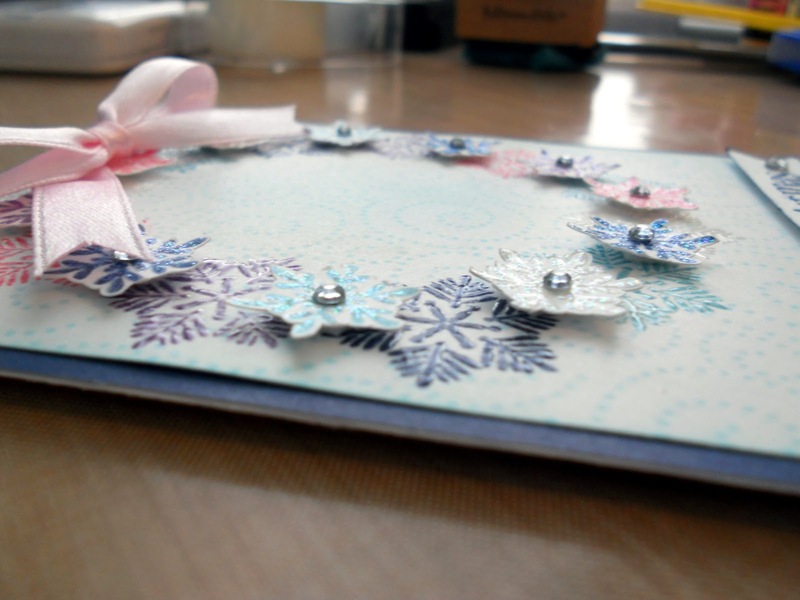 I buffed off the extra ink on top of the snowflakes. 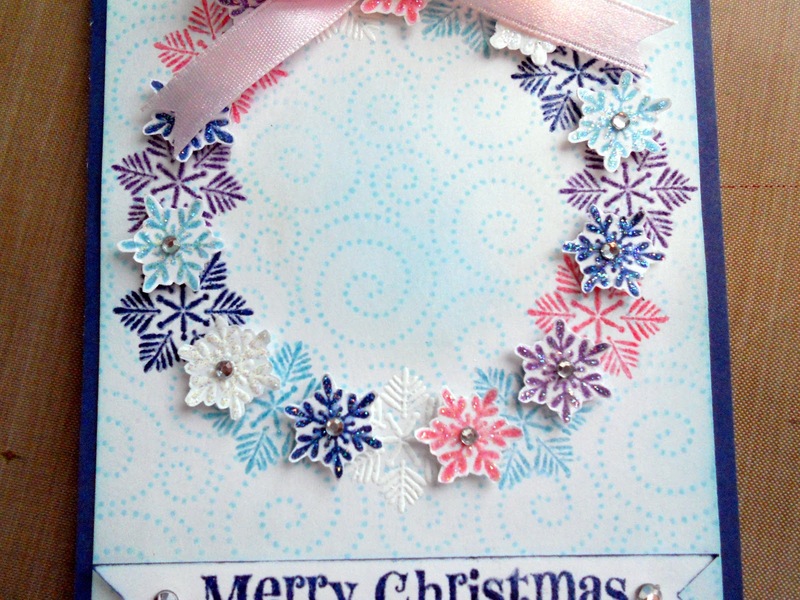 On another sheet of white card stock I stamped the medium snowflake from Magic of Christmas and cut them out. I adhered the little snow flakes with foam. I covered the little snowflakes with stardust stickles and then topped them with a clear rhinestone. For the sentiment I used another Hero Arts set Sending Holiday Cheer. I stamped in chipped sapphire and clear embossed. I cut the sentiment into a banner, inked the edges with more chipped sapphire, and added two clear rhinestones. The bow I made with my bow easy adhered with a glue dot. I really like how you made this wreath. It is lovely. Oh, I love the wreath that you created. 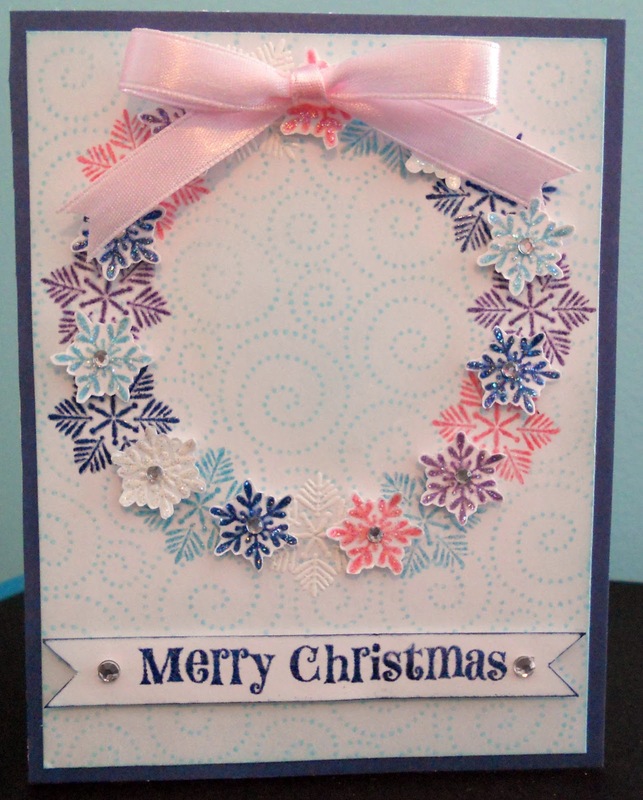 Beautiful wreath...so clever with the snowflakes!